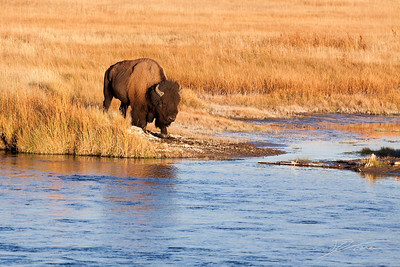 A large bison walks down to the Yellowstone River for a drink in the golden light of near-sunset in front of a field of amber, Autumn grasses. 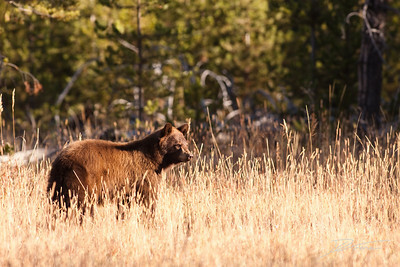 This is actually not a brown bear, but a cinnamon (or brown colored) black bear. 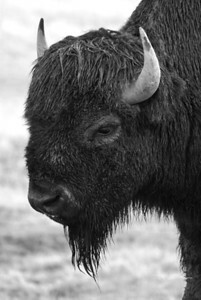 He stands among tall, golden, Autumn grasses in Yellowstone National Park. 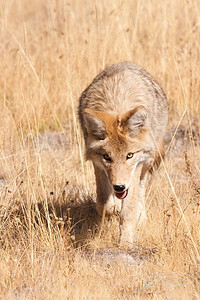 A coyote glares at the photographer with a look as though he is stalking the camera. 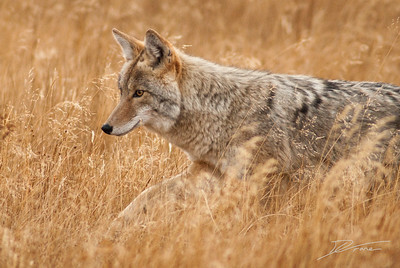 Behind the coyote is a golden field of Autumn grasses, matching the colors of the animal's coat. 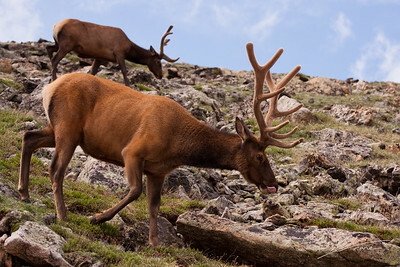 Two elk walk along a steep slope of green grass and many rocks. Both elk have large antlers covered in velvet. The closer of the two is licking his lips. A young coyote hunting for lunch in a golden field of tall grasses. 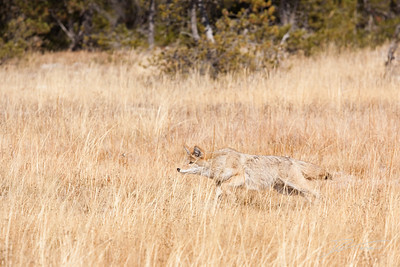 The coyote is running after a grasshopper that jumped away. 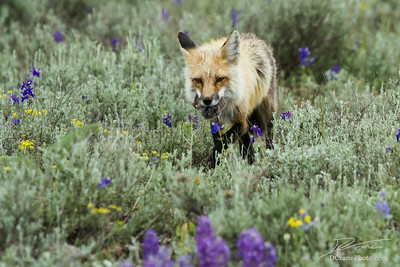 A red fox brings recent rodent kill back to his den. He walks toward the camera through a field of sage and purple and yellow flowers. 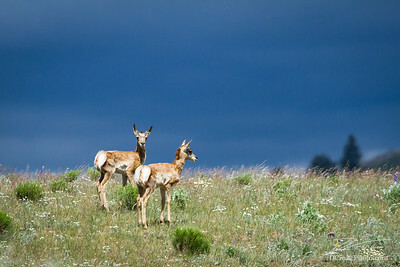 Two pronghorn fawns stand on top of a hill waiting for their mother to catch up. They stand in sunlight, but just behind them is a dark stormcloud that will bring rain in a short time. 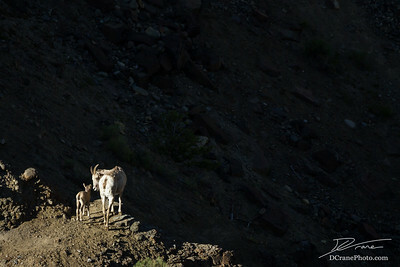 Momma goat (ewe) standing on a ridge, looking backward toward her lamb. 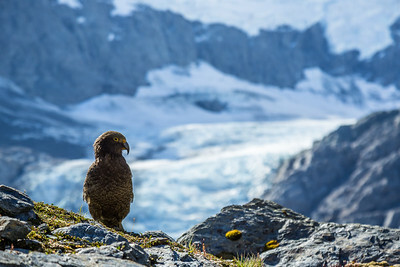 They stand on the ridge in the sun while the rest of the frame is in shadow. 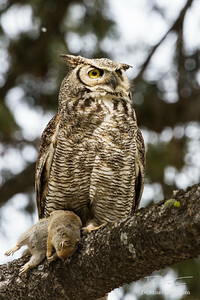 This juvenile Great Horned Owl hunted down a ground squirrel and brought it back up to a tree to enjoy a meal. 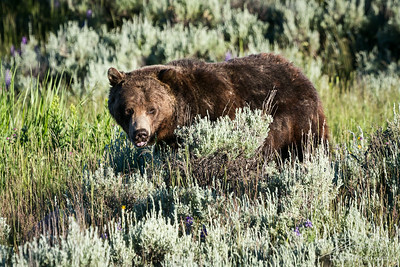 A large Grizzly walks through a field of sage and purple and yellow flowers in the Lamar Valley of Yellowstone National Park, Wyoming. 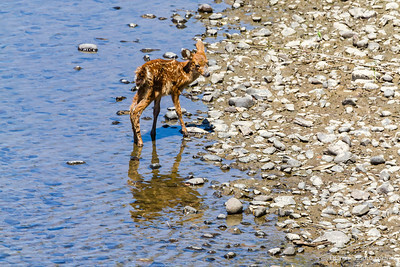 A newborn fawn wobbles its way to the water of teh South Fork of the Chehalis River to grab a drink, then head back into the trees. 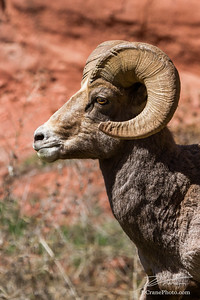 A mature bighorn sheep with a full curl in his horns stands proudly in front of a red rock cliff in central Colorado. 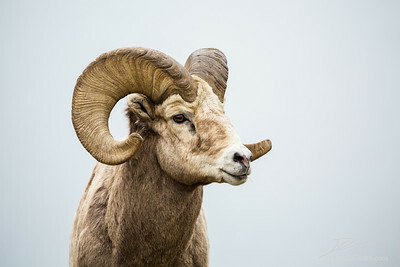 Close up of head and horns of a wild big horned sheep in Southern Canada. Background is a neutral grey fog over a lake. 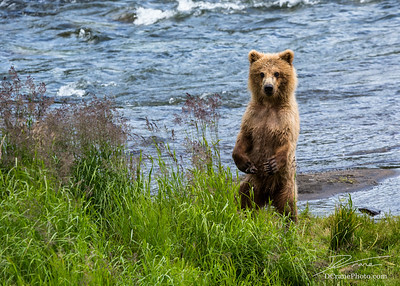 Young brown bear cub standing on its hind legs looking over tall green grass near the side of the Brooks River in Katmai National Park. 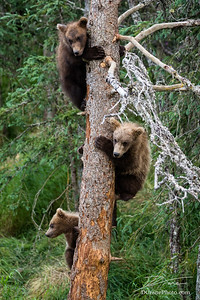 Three baby brown bear cubs have climbed this tree to escape a large male bear below, and are waiting for their mother to return to them. 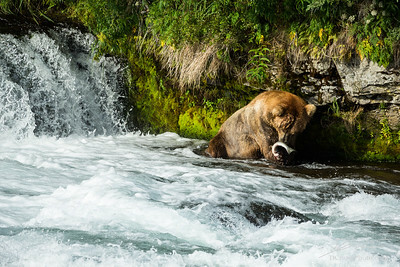 Large male brown bear catching salmon during the mating run in early July. 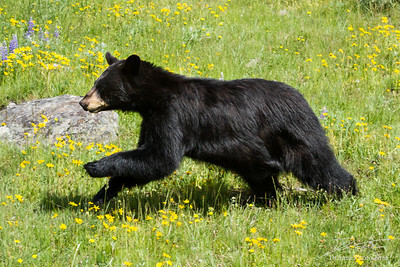 Many bears come to the falls during the salmon run to eat their fill of easy to catch fish. 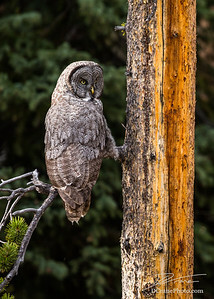 A great grey owl perched on a small branch of a dead tree searching for prey.